Shutter speed goes hand in hand with the aperture setting on your camera. They both influence how much light enters the camera & therefore the lighting of your photography. If you don’t know what shutter speed is, visit “What is Shutter Speed?” and “Shutter Speed Settings” to learn more. In this photography tutorial we are going to focus on the how and not the why – how to adjust the shutter speed. First off, as a beginner, your camera is most likely set to that oh so comfortable “auto” mode. We want to get out of our comfort zone and start understanding how our camera works and how to adjust the shutter speed. Switch to manual mode: twist your mode dial to the “M”. Once in manual mode you will be able to choose and control your shutter speed & Aperture. 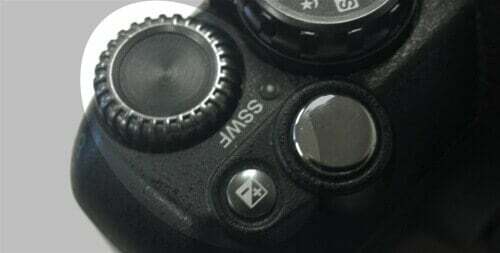 After you enter the correct shooting mode you’ll want to find your camera’s command dial (See photo below). 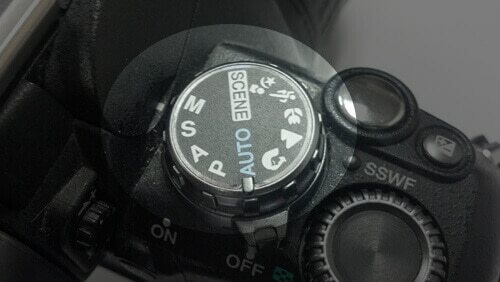 Depending on the mode you choose this dial will either adjust your shutter or aperture settings. In manual mode it does either and in the case of this camera you use the +/- button to toggle between the two settings. As you turn the command dial you can look through the viewfinder and see your shutter speed is being adjusted and the overall exposure is changing. This exposure is shown by a +0.0 style output. The higher the number the more overexposed you will be. You can also see your shutter speed & aperture settings by looking at your LCD screen. The goal (theoretically) is to have a perfect 0.0 exposure. Your shutter speed is measured as the time that the shutter is open. Your camera may be able to keep the shutter open for many minutes and be as quick as just 1/1600 second. Remember that the setting is typically a fraction of a second so the higher the number on the bottom of the fraction the faster the capture and the less light that gets into the camera. If shutter speed means the most to you (which it does in this tutorial) you’ll want to try out the shutter priority mode. The priority modes allow you to do half the work and the camera to do the other half. In the case of shutter priority mode we’re adjusting the shutter & the camera will adjust the aperture to be sure we have a good exposure. The shortcut for the shutter priority mode is shown as either an “S” or a “Tv”. Remember that a faster shutter speed is for fast action shots but can bring in less light while slow shutter speeds catches more motion which shows up on photos as blurs. This can be a cool effect, yet if not done properly you’ll have poor results. Keep in mind that your camera has limits. If the shutter speed is 1/60 or slower (like 1/30) you should be using a tripod to avoid camera shake. If you have low light and want to make your shutter speed quick enough to avoid camera shake (1/100 or faster) you must keep in mind your aperture is only able to open so much. Standard apertures are limited to f/3.5 and even smaller when the are zoomed in so be aware that you may need a tripod to improve the lighting. It’s important to remember that your camera isn’t the only element in good photography. I cannot thank you enough for these tutorials!!! It’s like I am in a classroom and being taught all this!!! You are damn good at making things simpler to understand!!! Kudos to a great job done by you!!! You have seriously just saved me hundreds of dollars! I was looking into taking a class at the local community college when I stumbled upon this site. I just had an “AH-HA” moment when you explained the metering mode. Thanks so much for these tutorials! I apologize for pointing this out but there is a misspelled word on this page. In the title listed above: ‘Shutter Speed Measurements’, the ‘e’ is missing in the word ‘Measurements’. It is spelled ‘Measurments’ but should be ‘Measurements’.